Here at the Dolmor Salon we pride ourselves in being your first choice for hair, but, we are proclaimed for much more than our hair services alone. We are your one stop for all things beauty. The salon now boasts an inviting Skin Bar with top of the line skin care products to guarantee healthy dermis from the inside out. The first certified organic product line that is hypoallergenic, fair trade, vegan, biodegradable & not tested on animals. Introducing Nelly De Vuyst- a complete skin care line that is free from parabens, GMO’s, gluten, perfume, alcohol, sulfates, silicone & chemical preservatives. Developed in Belgium & now made right here in Canada, the Dolmor is confident that we offer only the best for your skins health. The salon carries a full face care line from your facial cleanser, serum, gommage, toner & your moisturizer. 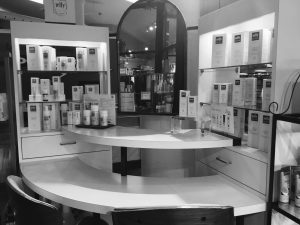 For an extensive explanation on all of the Nelly products available for purchase, visit our salon & speak to our trained esthetician. Book yourself a ‘Green’ facial with our esthetician Irene to discover what proper skin care can do for you.